The long, tree-lined avenue that leads you into Camping Lez-Eaux is like a shaded runway landing you at your holiday destination. At its end you taxi into a maze of camping pitches dotted, like a busy terminal, with folk from all across Europe; Belgians in board shorts, Dutch in wide brimmed sun hats and French holidaymakers folding out their deck chairs. 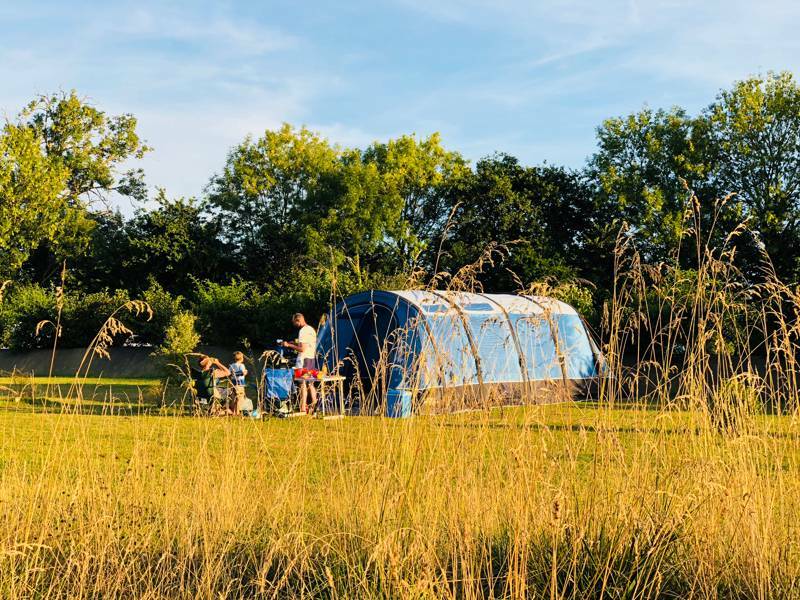 To say it’s a hidden nook of France then, would be like calling Babybel a traditional French cheese, but for all its commercial hum-drum and broad European appeal, Camping Lez-Eaux is still an exceptional place to stay. The grounds are spacious, the facilities are excellent and your children will have befriended their continental companions before you’ve even unpacked the car. Based around a 15th century chateaux, Lez-Eaux – translating as ‘close to the sea’ – is a family run site that’s now into its fifth generation since the building was first bought. Over the years, the camping area has steadily grown and altered shape, gradually spreading itself beyond the charming stony building with its outlying fishing lake. Despite a string of chalets and static caravan accommodation, the site still very much sticks to the traditional camping roots. 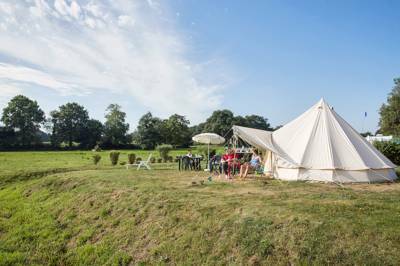 Tents cover the vast majority of the grassy pitches, each with ample space and an electricity hook-up if you wish to use it, and classic vintage campervans pepper one or two of the sunny spots. The atmosphere is laid-back and family friendly, while activities in the peak of the summer period give you a pleasing time-out if the kids are still running wild. 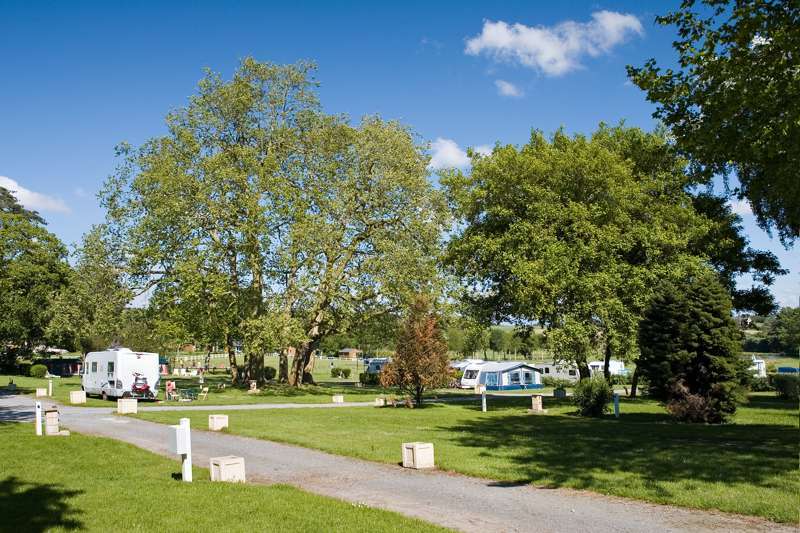 The real quirk of this campsite, however, is not in the age old essentials, like fresh croissants in the morning and a well-kept outdoor swimming pool, but in the newest additions that few other sites can match. Six meters up, in a pair of old oaks on the edge of the grounds, two strikingly cool tree tents are the envy of every canvas camper. Inside, the tree trunk forms a centre column, around which everything is orientated, with a plush double bed and a single for kids. They’re each reached by a spiral, wooden staircase, while a rope pulley system allows you to try hoisting your breakfast basket up and down in the morning – playful if not always the most practical! Elsewhere, sports pitches, paddling pools and tennis courts entertain, while, for most, the morning is one of readying and picnic-making for a day along the coast. It takes just four minutes in the car to reach the nearest beach, while a route designed for cyclists will lead you to the same spot in little over half an hour (ask at reception for a map). From here you can skirt south along the coastal roads, taking in historic settlements and endless beaches, or skip north a couple of kilometers further to the seaside town of Granville, home to a range of eateries, shops and a historic, walled centre. Castels campsites combine family spirit, French art de vivre and the quality of exceptional establishments. While preserving its values ​​of prestige, courtesy, comfort and tranquility, the chain combines tradition and modernity. Continually evolve and listen to the holiday makers of yesterday and today make the success of the chain that has lasted for more than 50 years. 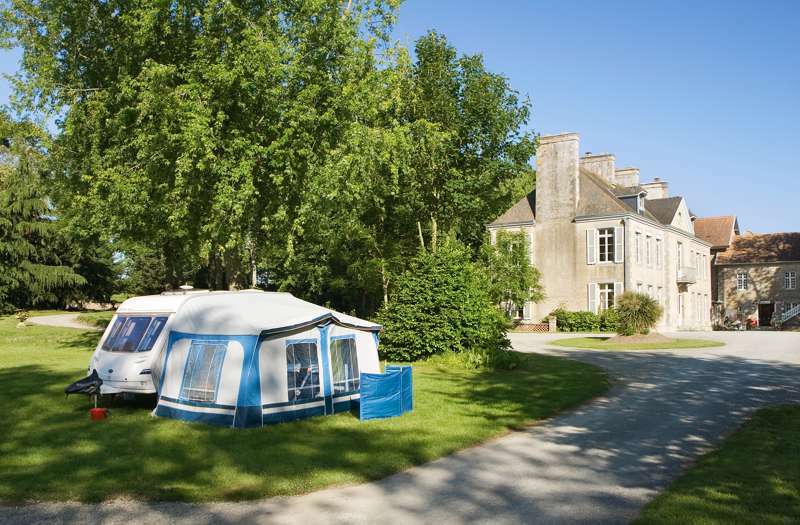 For latest availability and best prices for Camping Lez-Eaux, please use the Date Search above. 121 camping pitches, 59 chalets and 2 treehouses. All pitches include electrical hook-ups. There are 3 toilets blocks, 1 is heated and open all year, while the others are opened subject to demand. Hot showers are available all day. There are coin operated washing machines and tumble-dryers for laundry. Plenty of onsite activities: covered swimming pool, paddling pool and 3 slides, outdoor pool, (shorts are not allowed in the pool, swimming trunks only). bouncy castles, football and volleyball pitch, tennis court (5€ / h), a playground, a kids clubs (during July and August), a fishing lake and an onsite local market (during July and August). There is also cycle hire available. At reception you can buy tickets for trips to Jersey and Chausey islands. It's worth getting up early to get one of the first boats across, as the islands each deserve a good day trip, but they're well worth the visit. Closer to home, the campsite is just 8km from Granville, where a well preserved old town reveals the history of its military and religious past. The lower town is partly built on land reclaimed from the sea, while the upper half of the old centre is surrounded by 15th-century ramparts. There are various places to enter into the centre, the oldest via the Grand'Porte. The old town itself is dominated by the ancient church of Notre-Dame du Cap Lihou. The imposing granite building – early Gothic style – was actually built by the English during the Hundred Years' War. From the most westerly point in the town, a pinnacle that juts into the sea, you can look out at world famous Mont Saint Michel on a clear day. It's a 40km drive from the campsite and well worth the trip – though very busy during peak summer months. Onsite there is a licensed bar that also serves takeaway meals in the evening. The small reception shop has a few essentials plus, in the morning, freshly baked bread and pastries. For more choice drive the 8km to Granville where a huge selection of restaurants will keep you busy. Picorette (33 2 3359 9349) is a popular choice through the day, while OXC3 (33 2 3369 4682) is the place to go for dinner. 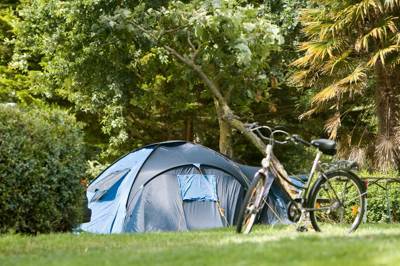 A camping pitch for 2 people, a vehicle and electric starts from 26€. From the A84 take the exit towards Granville and in Granville turn onto the D 973 towards Avranches (sign posted). Continue over the roundabout on the D 973 and after 4km the campsite is on your right.